There are 18 reviews of Numero Uno. This opens up soft with a slight medicinal mossy powdery aroma. And then you can smell violet and vetiver adding to the mix. Adding to this is herbs and musk. It smells strange and uneven to my nose and the violet with that medicinal accord stand out like a sore thumb. Good ingredients but this scent really rubs me the wrong way. Smells like cosmetic hand-cream with it's powdery violet medicinal accord. One swears there is a predominance of oak moss in this chypre, but neither it nor its enforced substitute are present in the note tree. I am reminded of great masculine chypres of the past, such as Aramis and Great Jones. The combination of sweet and bitter elements balanced together is the significant identifier of this type of scent. It keeps seesawing between fougere and chypre, but finally comes down on the chypre side in its dry down. Although Carthusia only lists four notes, other reviewers on these pages have suggested an even dozen more in their olfactory responses. It's a very fine masculine, not in your face like some of the 80s powerhouses it resembles, but dry and subtle, sophisticated, in the background, as a scent should be. I am eager now to try Carthusia's Uomo. This is a nice woody "chypre" style fragrance. I like it a lot! It has just enough spice and kick to keep it interesting and with character. I want to say it's a "mossy" fragrance... but there's no oakmoss listed in the notes. Instead, there are a selection of many different dry green herbs and labdanum, which gives this a rustic, bitter and green feel. The real component that sets it apart is the orange note... and the orange here is paired up with the background bitter, moss-like herbs to give it an overall masculine feel. This really is like Guerlain - Mitsouko but with an orange note. However Mistouko is sweeter overall. I also think this that Numero Uno is more bitter, and therefore more masculine. I would say this is Mitsouko but mixed with Terre d'Hermès. It has a rugged, "dirty" or "mossy" orange... amongst all the Mediterranean herbs and spices. I think it's a very good choice for men. This is definitely one that more men should check out. The price (for a niche house) is not so high as other brands. It's a fragrance which evokes the masculine styles of the past (the fougères and mossy chypres of the past) but with a unique modern twist (the orange note). Very wearable. I would say try rather than buy before trying. Very nice though, worth a look. Carthusia’s Numero Uno is an soapy green citrus chypre in a deliberately retro style that has its roots in mid-twentieth century masculines like Chanel pour Monsieur and Monsieur de Givenchy. It differs from its precursors in being at once more sweetly fruity on top and more bitter-soapy at its core. The exaggerated discrepancy between fruit and cleansing agent may have been intended as a kind of olfactory chiaroscuro, but if so the “modernist” gesture leaves Numero Uno’s structure feeling less integral than its older cousins from Chanel and Givenchy. Lemon, bergamot, petitgrain and lavender dominate the opening, with moss, geranium, clary sage and patchouli notes sliding in underneath to provide the foundation. A mellow labdanum-seasoned amber base note rounds out the chypre structure and anchors the bittersweet resinous drydown. While Numero Uno may not hang together as well as older citrus chypres – Cristalle, Chanel pour Monsieur and Monsieur Givenchy included – I credit Carthusia for introducing a new fragrance in this style. The fragrance works well as a revival, though I’ll still reach for the reissued Monsieur de Givenchy when I want a soapy green citrus chypre. To my nose this is a aromatic fougere-ish musk with a reluctant nod to the Mediterranean style of eau de cologne, meaning culinary herbs like thyme and rosemary come into play to bolster the citrus' piquancy. Lavender unfortunately plays the party-pooper here, taking away the natural vibrancy of the citrus-herbs interplay. The fragrance concept while admirably rustic fails to capitalize on the strengths of the style and flounders at the execution level, resulting in a ho hum and somewhat muted, muddied presentation. I'd still wear it with nary a thought but Numero Uno it is not. 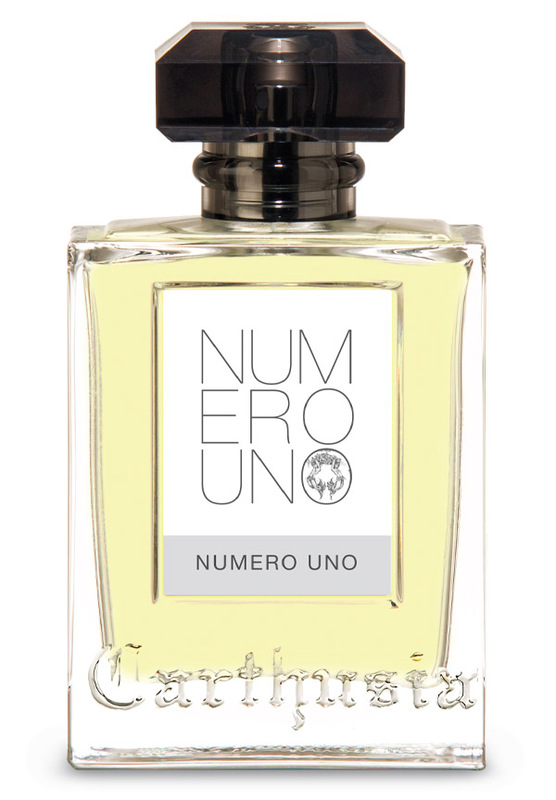 Cons: Too dull for a numero uno"
A huge fragrance, bold and distinguished. Its initially (barely) dirty and exotic (spices and ylang-ylang?) floral musk on the side of the grassy, camphoraceous, aromatic and ambery patchouli conjures me a bit the classic Aramis although the latter is more spicy-animalic while Numero Uno is in my opinion more bright, fine, slightly boozy (the bitter orange effect) and finally clean. Something in the air smells like a far less massive, animalic and thick sort of Mazzolari Lui (camphor, musk, ambery patchouli, vetiver, some floral element ect.). The combination of violet leaves, lavender, aromatic herbs (thyme, rosemary) and bitter orange (i mean the finest part of the blend) produces a complex fruity-floral whirl complemented by elegant patchouli and grassy vetiver over a cool musky-mossy base with a touch of ambergris and sandalwood. The outcome is smooth and floral with a featuring fruity-boozy patchouli, a touch of exoticism, elements of classic austerity and a spicy-rooty and ambery (sharp amber) spark swirling in the air. One of the best around. There are no member images of Numero Uno yet. Why not be the first? Carthusia Numero Uno. How is it? Anyone try Carthusia Numero Uno?